A Cardboard Problem: Is Topps taking care of redemptions? It seems as though Topps is taking care of redemptions. I noticed a few people on Twitter making a note that they received several redemptions, and, sure enough, I got a package at my door. Literally. It didn’t actually fit in the mailbox, so it was left in front of my door. 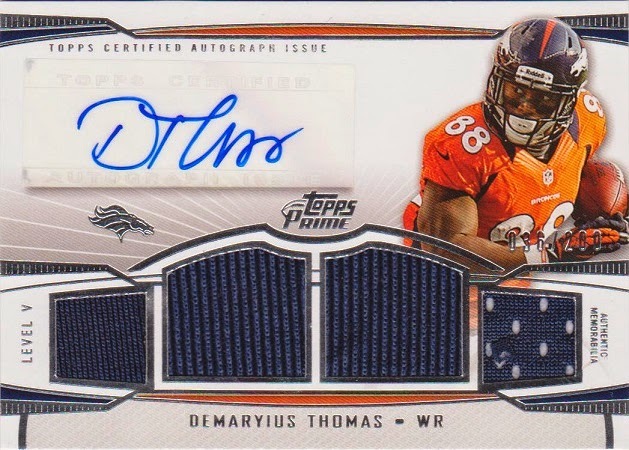 I got two of three of the redemptions I’m waiting on, including the picture on top of the 2013 Topps Prime of Demaryius Thomas autograph. The final card I am waiting for, however, is a Billy Hamilton autograph relic refractor from 2013 Bowman Platinum. Funny thing about this card … I’ve seen a bunch of these on eBay for MONTHS. I get those frustrations of collectors who wait on cards when they see newer autos of the guys they are waiting on. It’s baseball season. It would be nice to get the Hamilton card. I sure hope they are working on it. I've got 7 open redemptions in the system, with 0 successes thus far. Whenever R.A. Dickey gets around to signing his cards and sending in a jersey to be cut up for swatches that will take care of 5 of the 7 outstanding redemptions I have, but there are others that I've been sitting on for months. Congrats on getting one of yours filled! I know I had to wait over a year for my John McEnroe A&G auto from 2011 and he had actual on card autos in 2012. I realized why Topps doesn't number it's autograph issue, instead labeling them with letters, is that if for some reason they never get the person to sign, which seems to happen quite a bit, then it doesn't leave an obvious hole. It showed up within two weeks! I was amazed. My Cano/Mattingly dual relic auto from 2013 Tier One is still pending. It's been pending since, well I can't even remember it's been so long. Maybe November? So frustrating.